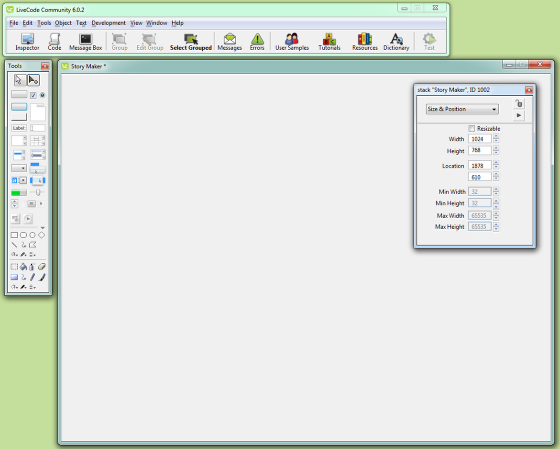 This tutorial shows you how to create an app which allows the user to create a small story by choosing the character's name and description. 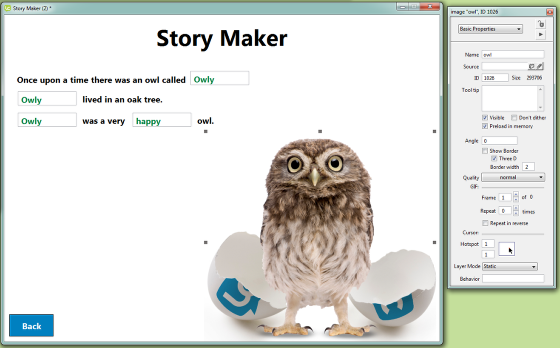 The app demonstrates building a GUI, working with text, asking the user for input, animation and sounds. To start a new app you first create a new stack. Select New Mainstack from the File menu. Next you want to name the stack. 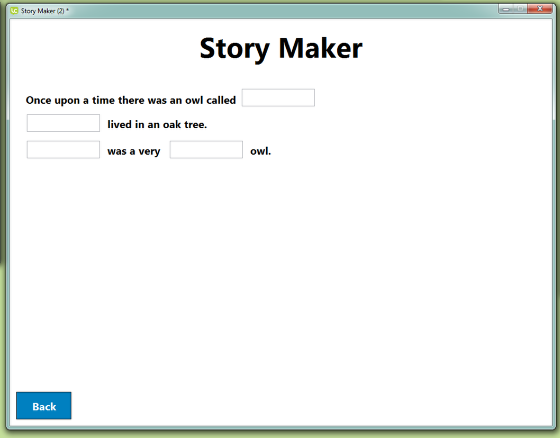 This is done by opening the Property Inspector for the stack and setting the name property to "Story Maker", or whatever you choose to name your app. If you are planning on deploying to a mobile device it is a good idea to set the stack to the correct size at this stage. The size for an iPad is 1024 x 768. 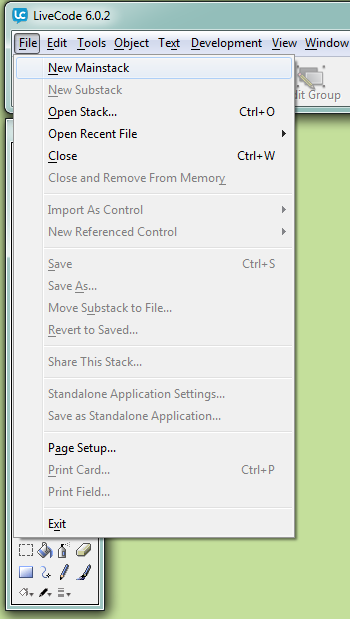 You can also turn off the Resizable property so that you don't change the stack size by accident. 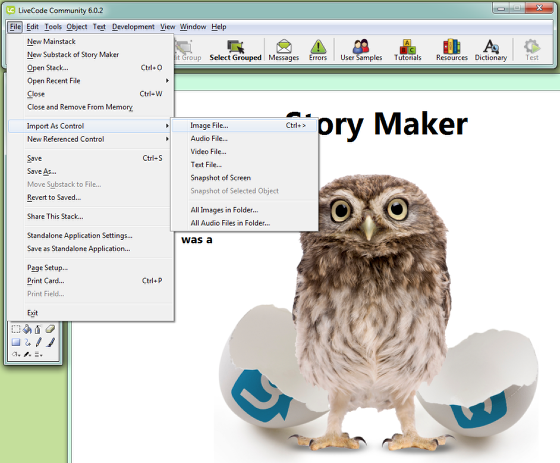 A label field is not editable by the user to is a good choice for a title. - By default label fields don't wrap the text so turn off the dontWrap property in the Basic Properties pane to allow the text to go onto more than one line. 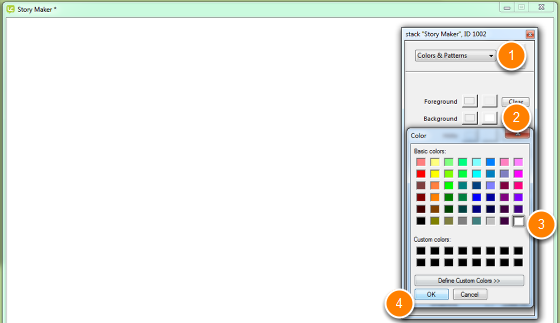 Drag a square button out from the Tools Palette onto the stack. 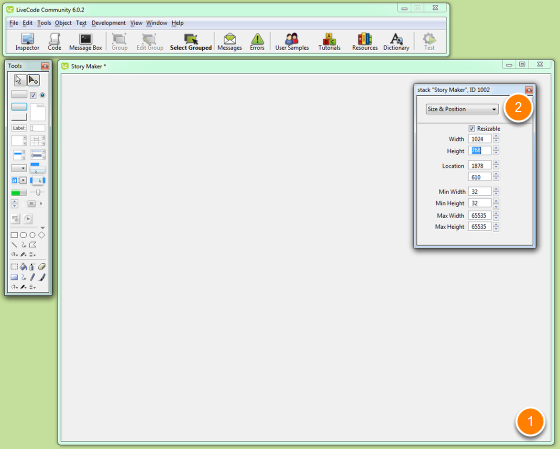 As before use the Property Inspector to name the button and then resize the button as you wish. - A button can have a name which is used to refer to it in script, and a label which is the text that is displayed on the button. 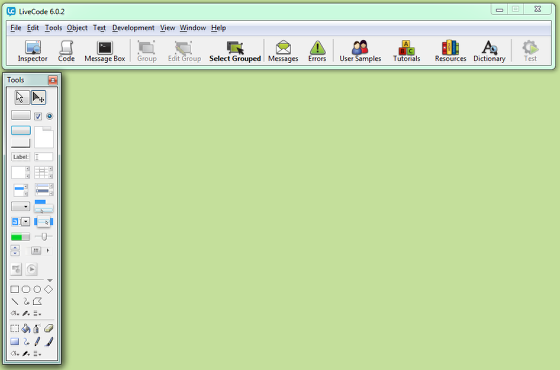 Set the label of the button to "Start writing the story". 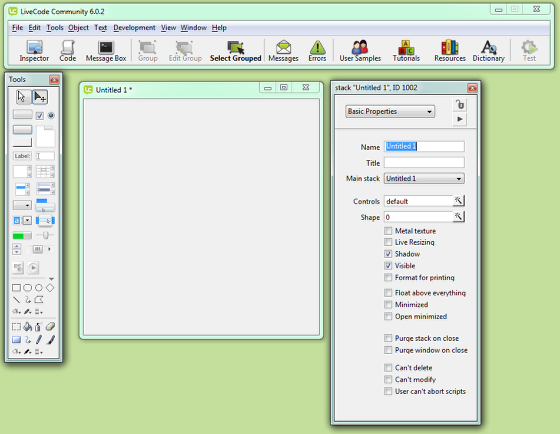 Drag a field from the Tools Palette and place it after the label field you just created. 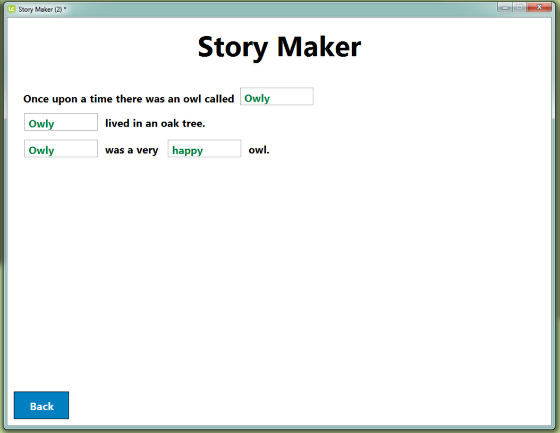 - Set the name to "name1"
My story has 4 label fields, "part1","part2","part3" and "part4", 3 fields that will display the owl's name, "name1","name2" and "name3" and one field that will describe the owl, "description". 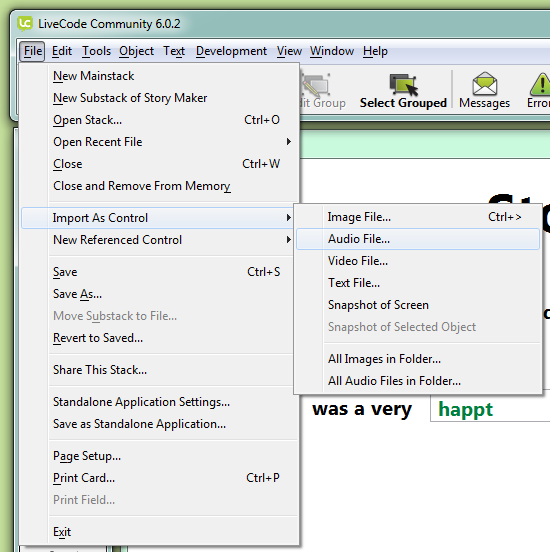 LiveCode is an event driven language, this means that is waits for a user interaction and informs us when one takes place. 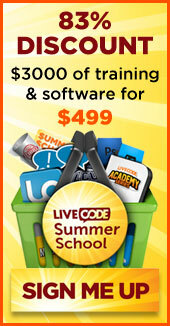 We create our application by deciding which events to respond to and creating handlers with name that match the event. The code in the handler is executed when the matching event occurs. 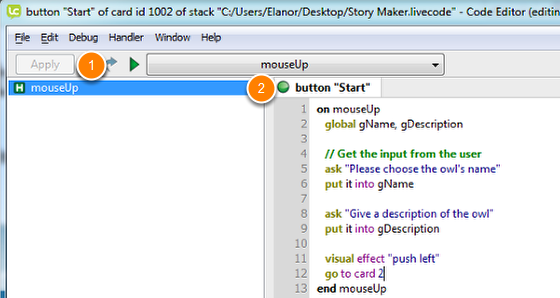 You will see that the button script is automatically populated with an on mouseUp handler, we just need to fill it in. 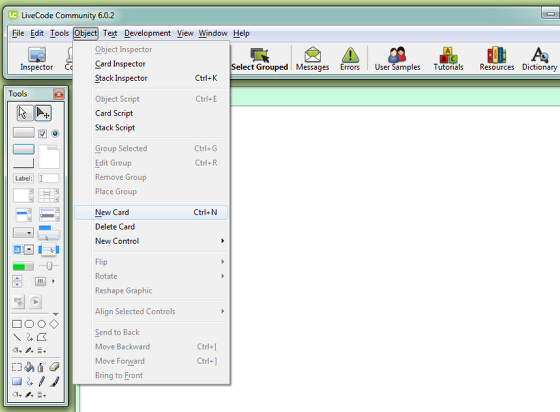 To do this we add a handler to the card script which is called when the card is opened(arrived at, gone to). By handling this message we can update the card when it is opened. This message is openCard. opine the Card script from the Object menu and add the following handler, this will play the sound we just imported when the move command completes. Elanor Buchanan is a Senior Software Developer for RunRev Ltd.